Common and sometimes abundant throughout England and Wales including the Isles of Wight, Scilly, Lundy, Anglesey and Man; the highest density of records appears to be from the southeast and the midlands. Widespread in Scotland north to Easter Ross with most records from the east, the only island record is from Skye (NBN). Typically the species may be found among vegetation or under debris in open and rather dry situations e.g. arable land, parkland and gardens but theyt are no means restricted to such habitats; Lindroth adds ' gravelly ground with sparse but often tall vegetation eg in gravel pits and railway embankments'. 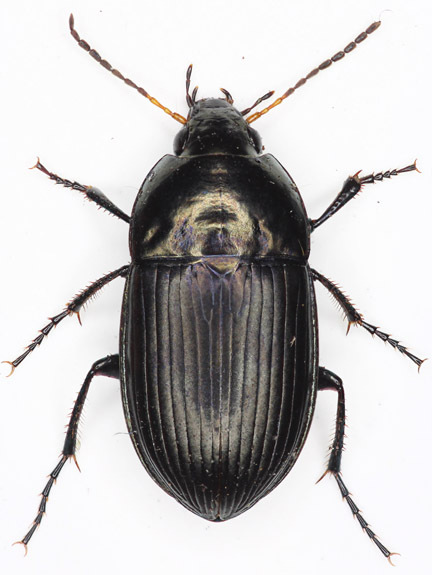 They are common throughout our Watford area but we have never found them to be abundant; they occur around the edges of Whippendell wood and, during warm summer nights, are active nocturnally under the sodium lights by the river Colne along Radlett road. The species is a spring breeder and at this time they are likely to turn up in pitfall traps in most situations; during May 2007 we found a specimen in the town centre, running on the ring round at 2 am. During the winter we have often recorded them from beneath bark or among thick moss on logs below cassiobury park, during February 06 ten specimens were found together under the loose bark of a dead birch stump in Oxhey woods. Very similar to A.similata with which it may occur. 8-9.5mm (Luff, 2007). 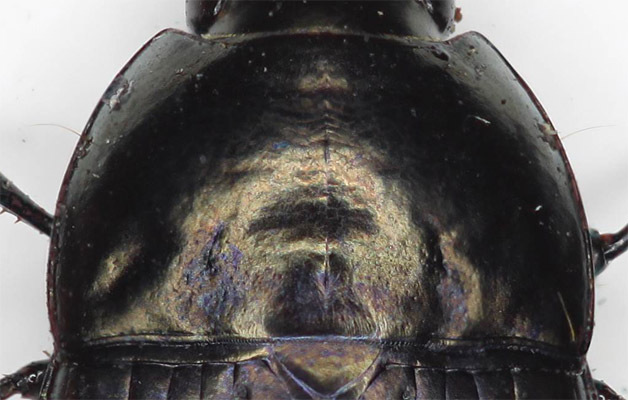 Body entirely shiny black (elytra slightly dull in female, obvious when compared) with a strong metallic reflection; bronze, brassy greenish or occasionally blue. Head smooth and shiny or with weakly developed frontal furrows, with two setiferous punctures beside convex and weakly protruding eyes. Palps dark or with apex of segments lighter. Antennae black with segments 1-3 and at least base (often more) of 4 clear yellow. Sides of pronotum evenly curved from rounded and protruding front angles to almost perpendicular hind angles, this must be viewed directly from above to avoid distortion. The lateral curvature is occasionally atypical; we have a specimen (verified) in which the basal half is straight or very nearly so, in all other respects the specimen pictured is a typical ovata. Basal fovea vary in strength but are never well developed; outer may be a simple shallow impression, inner generally with a short impressed line at apex. Base not puntured or with some very fine punctures around or within the inner fovea, only just visible at X10. Hind margin very weakly sinuate inside hind angles. Setiferous puncture inside hind angles close to lateral edge; separated by the width, or a little more than the width, of the puncture 1. Scutellum impunctate, shiny as surrounding elytra (male and female). Scutellary stria with a pore at base (IDAids). All striae fine at base becoming deeper towards apex, interstices flat at base becoming convex in apical third and strongly so near apex. Legs mostly dark; tibiae (usually) as dark as femora. 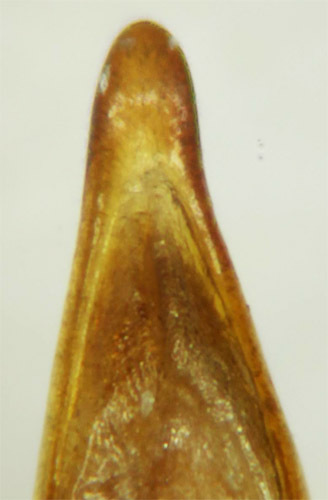 Front tibiae deeply notched inside before apex, apical spur simple (ie not trifid cf A.plebeja). Male with three basal pro-tarsal segments dilated.